Every spousal support case is unique. The information below is intended to give you a general overview of spousal support law and is not intended as specific legal advice for any particular case. For a better understanding of your particular case and needs, we encourage you to call our office at 619-236-0533. All married persons have a duty to support their spouses under California law. California family courts have the jurisdiction to award spousal support in all divorce and legal separation cases. Whether a party will receive spousal support, and how much they will receive, is within the discretion of your family law judge. This means that skillful and experienced legal representation is important to obtaining an advantageous outcome, whether you are a recipient or a payor of support. Please call us 619-236-0533 for a no obligation conversation with a paralegal or attorney about your specific spousal support questions. In general, the greater the disparity in income between spouses, the greater the likelihood that support will be awarded to the lower earner. Other considerations include the length of the marriage and the parties’ standard of living during the marriage. There are two types of spousal support orders which are based on different legal considerations. The first is temporary, or interim support, which is ordered at the first court hearing following the parties’ separation where someone asks for support to be ordered. It is important to note that you must ask for spousal support to receive it. This means filing a formal motion with the court. The court will respect most agreements that you reach with your spouse, so it may not be necessary to file a motion if you agree on support, however, it is essential that you have your agreement filed with the court as a formal order. The purpose of temporary support is to make sure that the supported party has adequate income to maintain the standard of living during the marriage during the divorce or legal separation proceeding. Guideline computer formulas are available to assist family law judges in making their decisions regarding spousal support, however, unlike with child support, such guideline formulas are not mandatory. This means that if you have a good argument for raising or lowering a temporary order, you can greatly benefit from representation by a skilled and experienced attorney. 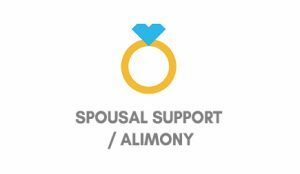 The second type of spousal support order is post judgment support. This is the amount of support that will be paid after the divorce or legal separation judgment is final. As stated above, the legal considerations are different from that of temporary spousal support. Judges are forbidden from using guideline formulas when making post judgment orders and they must consider a host of circumstances regarding the parties’ marital relationship. This means that skilled and experienced representation is even more crucial in obtaining post judgment orders as such orders often impact both spouses’ financial well-being for years into the future. Both spouses are required by law to set forth their income and expense information in court mandated documents, signed under penalty of perjury. This information will include copies of pay stubs, W-2 forms, tax returns and financial statements from self-employed business owners. Deductions for spousal support under California law are not identical to deductions that are used on federal or state income tax returns, although some are. California family courts are not required to recognize all deductions that are recognized by the IRS, so understanding how to properly prepare an income and expense declaration is critical to being able to calculate an accurate spousal support order. This means getting the most money for the supported party and making sure that parties who are paying support do not overpay their obligations. Many spouses contact us because they are frustrated that the other works “under the table,” works sporadically or otherwise tries to hide their income. Sometimes an otherwise capable and able-bodied spouse fails to work enough, or refuses work at all. Such spouses should know that we can help in all of these types of cases. In many cases we can use the power of the formal court discovery process to expose these individuals and obtain fair and accurate support orders based on the income that is being hidden. In other cases we can obtain orders for the court to impute income to spouses who either under-perform, refuse to work or generate income which is hard to find. In these cases the court will make orders for support based on the other spouse’s ability to earn, regardless of whether they are working or failing to report accurate income. We can also assist with collecting spousal support arrears. In many cases, spouses who are self-employed or unemployed are unjustly accused of hiding income or failing to earn money commensurate with their experience and abilities. In these types of cases representation by a skilled and experienced attorney is essential to obtaining fair and accurate orders. If you are self-employed or own a business, proper presentation of your case to the court by a competent legal representative can vastly improve your outcome. Courts do not have the power to award spousal support prior to the date that you file a motion to request it, so each day that passes without doing so means lost money that you may never retrieve. Many spouses agree to informal payment of spousal support without the benefit of court orders. This only works until it doesn’t. In other words, if the payor decides to stop paying on a verbal agreement, you will not be able to enforce that agreement. The same holds for a written agreement that is not filed with the court as an order. If you are in need of a spousal support order, please call us at 619-236-0533 for a no obligation telephone conversation with an attorney or a paralegal about the specifics of your case. Often parties finalize their divorce or legal separation proceedings without clear orders as to when support should be modified or terminated. Sometimes no orders for support are made at the time the case is finalized because a party who would otherwise pay support is unemployed or underemployed. In some cases a payor of support will lose their job or their earnings will decrease significantly. Whether you are a recipient of support and you believe that your orders should increase, or you are a payor and need them to decrease, you must act quickly to obtain legal advice. Verbal agreements are unenforceable and failure to either file a motion to modify or file an agreement as a formal order with the court can have disastrous consequences. Motions to modify support are often filed years after a case is finalized and the outcome of such a motion can and will impact both parties’ financial well-being for years to come. We have handled many such cases and will be happy to discuss the specific circumstances of your case. California law provides that, in many, but not all cases, recipients of spousal support may receive a contribution to their attorney fees from the payor of support, if they are represented by counsel. Such an award can be made in proceedings for either an initial award or a modification proceeding. A payee may also receive an award in a proceeding to collect arrears or enforce an existing order. This does not mean a dollar for dollar reimbursement of fees, but rather a contribution based upon the payee’s need and the payor’s ability to pay. The court will not make a determination of whether, or how much to order for fees, until after calculating the amount of child and/or spousal support due and subtracting that amount from the payor’s income. If you are a recipient of support, this information can be beneficial in making your decision as to whether you will hire an attorney to assist you. If you are a payor, it is important to understand your possible exposure to an attorney fees award before you negotiate or litigate. For a no obligation conversation with a paralegal or attorney regarding spousal support and attorney fees and your particular case, please call us at 619-236-0533.